The last time I saw the vaguely-Portland-based quintet Hockey, they were tossing out free beer to a crowd of listeners at Lollapalooza, a sort of consolation prize after their set was cut short due to a significant lack of power to the stage. This time, there were no such energy crises, and also no free beer. 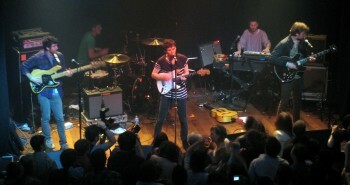 But the band has tightened up their act a good deal since their turn on the Lollapalooza stage. 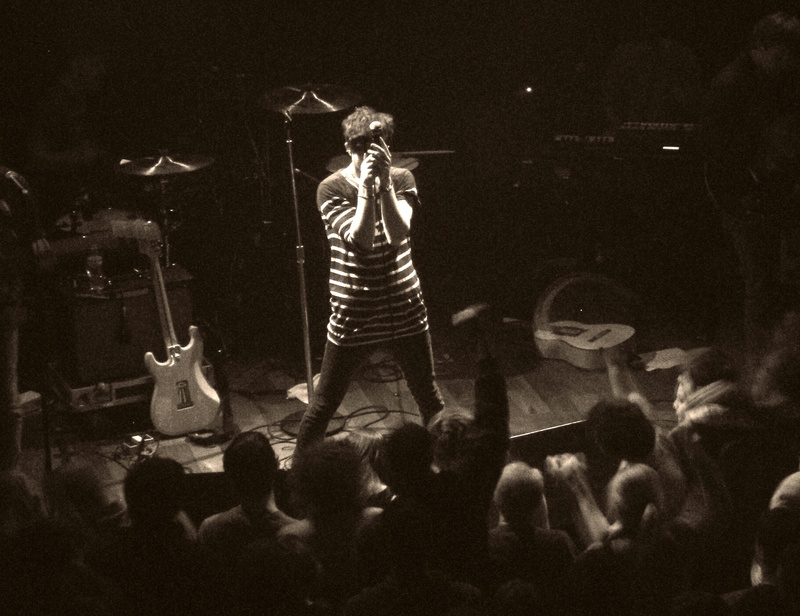 They seemed much more at home in front of the sold-out audience at Lincoln Hall, and slightly less nervous, to boot. Singer Ben Grubin was just as animated as always, twisting and posing and gesturing along with the music. While the band has a decidedly 80s, new-wave sound, they showed that they can take it down a notch, with Grubin strapping on an acoustic guitar and a harmonica for a song. The band played most, if not all, of the songs from their debut album, Mind Chaos, as well as a few new tracks. Granted, they don’t have that much material, but they did manage to stretch it out to be about an hour and fifteen minutes of music. With the exception of just a few down-tempo songs, their entire performance was highly energetic, with some expertly timed flashing lights and yes, even the disco ball at Lincoln Hall got some action. The band is still very young, though, and that showed during the sometimes awkward silences in between songs. Perhaps the band just wasn’t connecting with this audience very well, or perhaps they’re just still working out how exactly to work a crowd, but their attempts at banter fell flat. Working a crowd is something that takes time to perfect, especially if it doesn’t come naturally. This crowd wasn’t an easy one to connect with, anyway; it seemed like everyone came to hear Hockey’s more well known songs (“Song Away”, “Too Fake”, “Work”) and then completely checked out during most of the other tracks. I’m looking forward to watching Hockey mature as a band and add to their repertoire. They’ve clearly got talent and charisma, they’ve just got to learn to leverage it better, especially against slightly disinterested crowds. See the rest of my photos over on Flickr.